The Greenough Greenway project in Watertown, Massachusetts is the recent recipient of the Institute for Sustainable Infrastructure (ISI) Envision Bronze award. The Greenough Greenway project’s objectives include enhancing public safety along the river, providing a fully accessible multi-use path next to the river, reclaiming parkland and enhancing the scenic value of the Charles River Reservation, improving the environmental quality of the Charles River, and maintaining Greenough Boulevard as a fully functional parkway, as well as demonstrating an efficient and cost- effective public/private partnership. The $2.4 million project will reduce the cross section of Greenough Boulevard, a Massachusetts Department of Conservation and Recreation (DCR) parkway, which runs between the Eliot Bridge in Cambridge and Arsenal Street in Watertown. The cross section reduction allows construction of a tree-lined, ten-foot wide, multi-use path, a substantial green buffer separating pathway users from automobile traffic, stormwater drainage improvements, and a generous strip of parkland to sustain the river bank. The path links to a broad network of regional recreational paths, and improves access to diverse land uses adjacent to the corridor. The Lawrence and Lillian Solomon Foundation, in close partnership with the Department of Conservation and Recreation, championed the project. VHB led the design effort. As a collaboration between ISI and the Zofnass Program for Sustainable Infrastructure at the Harvard University Graduate School of Design, the Envision system rates the impact of sustainable infrastructure projects as a whole. The ISI Envision system measures sustainability in five categories: Quality of Life, Leadership, Natural World, Resource Allocation, and Climate and Risk. These key areas contribute to the positive social, economic, and environmental impacts on a community. 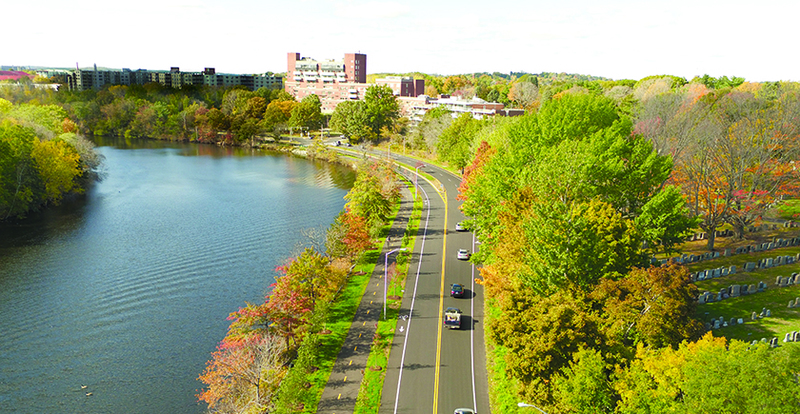 Quality of Life: From inception, the project was developed to align with existing local community and regional plans and advance the established goals of the Master Plan for the Charles River Basin (2002) and also meets several recommendations included in the Charles River Basin Connectivity Study (2013). The project transforms a degraded, mile-long section of the Charles River by reducing pavement and restoring natural landscaping, increasing safety for cyclists and pedestrians, and providing improved access to the Charles River and nearby recreational facilities. The design also calls for the installation of 12 new benches along the corridor for residents and users of the path to relax and enjoy the river. The project has broad community support as evidenced by the public-private partnership between the Foundation and DCR, as well as endorsements by community boards in both Cambridge and Watertown. Leadership: The Greenough Greenway project successfully progressed from early concept through to design completion as a result of effective leadership and commitment to sustainable development by the Foundation, DCR, and VHB Engineering, Surveying and Landscape Architecture. Collaboration and teamwork played a large part in the success of this project due to its multi-jurisdictional nature. Several opportunities for community engagement were provided during the planning and design stages of this project. VHB, a multi-disciplinary team that led the design, engaged and executed an integrated, whole systems approach that relies on the principles of effective collaboration and teamwork. This project was designed to integrate with other elements of community infrastructure, resulting in an overall improvement in infrastructure efficiency and effectiveness. The team hosted several community meetings to seek ways to improve connections to other major roadways, amenities and residential areas. The resulting project restores a previously sub-par pedestrian and cycling path along Greenough Boulevard and strengthens the final link in the recreational loop of trails connecting to Herter Park. Natural World: The project also preserves floodplain functions by avoiding new development and reducing impervious cover on land immediately adjacent to the floodplain. Water quality modeling was conducted as part of this project to ensure that the project would improve pre-development floodplain infiltration along with the quality of the water flowing into the Charles River. The project team designed the Greenough Greenway project to incorporate plant species that do not require the use of fertilizers or pesticides. Only local or non-invasive plant species were selected for the landscaped elements of this project. To learn more about the Greenough Greenway project, please visit http://solomonfoundation.org/pages/projects/her.html.